Aidan is our average kid, loves to play and have adventures. The one thing he does not like is vegetables. He finds himself off on an adventure when he realizes he is in a castle cell and the castle is made of carrots!! Tap around and help him out through the story. You can tap along and help him eat his way to safety and tilt and twist the iPad to slide him down the path to escape! Aidan learns in the end that vegetables really are good for him. Follow along and find out how this happens. The interaction in this book app also helps in fine tuning fine motor skills. Aidan doesn’t like vegetables and takes off on an adventure! Tap and tilt to help him to escape the castle! What was the initial inspiration for The Prisoner of Carrot Castle? I have a passion for healthy eating and teaching others how to be healthy. Out of this passion, being a children’s writer and wishing to contribute to the fight against childhood obesity, I wrote The Prisoner of Carrot Castle. Making it into an app would bring the book to life, so I contacted Kate Jeong to illustrate the world of Carrot Castle and enlisted my son to program. I love the parts where kids interact to help Aiden in his adventure. By helping him eat vegetables that get him out of his current dilemma, they can get the idea eating vegetables might help them out too. 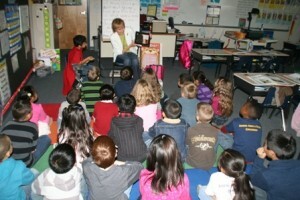 Recently I had the pleasure of being the only iPad book read at an elementary school Read-a-thon. I had the kids interact with the book and even dress up to be Aiden. They loved it! Teachers realized that an interactive book opened up opportunities for reluctant readers to become engaged. 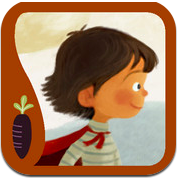 Look for more book apps about the imaginative adventures of Aiden.